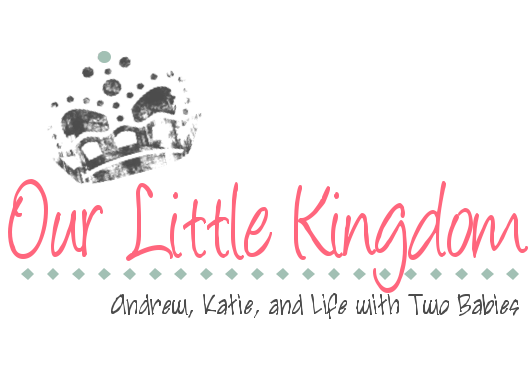 Our Little Kingdom: The Beach! We have been blessed with such great weather lately! Last Friday we decided that the day was too beautiful to resist and decided to take Holly to the beach for the first time. We wanted to avoid the spring breakers, so we went before spring break "actually" started. Although the weather had been gorgeous, the sand and the water were still pretty cold! 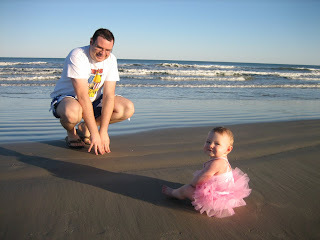 We wasted no time putting Holly down in the sand and she enjoyed it--at first. 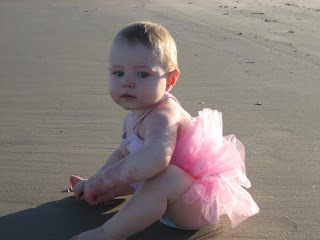 Then she started getting a little cold and nervous about the whole beach thing. We tried to splash in the water and have as much fun as possible so she would see that it was okay! It kind of worked, and she started warming up to the idea again. I think that Holly will LOVE the beach this summer when it warms up. All in all, it was a good little trip! Other things that are going on in our house: a couple of days ago, Holly took her first steps. She is 9 1/2 months old, so I think this fully qualifies her as a maniac! She is also fighting sleep like a pro--naps, bedtime, whatever--and I think it's because she is learning so many new things during the day! I also have a suspicion that she thinks she is missing out when she goes to bed. What can I say? She is! Andrew and I watch TV and eat ice cream after she goes to bed! Being a grown-up does have its perks. Oh my gosh! That tutu suit is so cute! And I can't believe she is walking! What an adventurous little girl. those pictures are so dang cute katie! and i love the play date holly and leah had! wish ellie could join in on all the cc fun. Hey Katie! 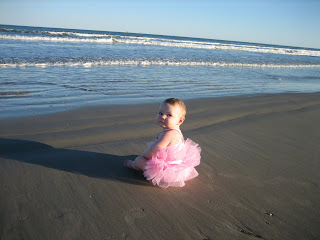 I found your blog again :) I LOVE Holly's ballerina bathing suit! It's adorable.